There are only two places in Pokhara which i haven't visited the last time i was here: The Mountain Museum and Gurkha Museum. Both of which fascinated me because i am a big fan of the Himalayas and the most-feared soldiers in the world - the Gurkhas. This time around, i had more time in my hands so i was able to negotiate a cheaper taxi cost to visit both, though not on the same day. Along with my Korean friend whose bargaining skills is exceptional, off we go. I found the Mountain Museum more thorough with the collection. Amidst the 400 rupee entrance fee, i was able to read about all the highest peaks in and around Nepal, the amazing duo of Hillary and Tenzing Norgaray, and even watch a short documentary about the fabulous set of mountains. I spent more time here, and the taxi driver was a bit bothered but spending 1 hour here is totally impossible, minimum is 2. The mountain view today wasn't so clear. In some days, the peaks were so vibrantly displayed in confidence. In an effort to veer away from the usual places like Devis Falls, Peace Pagoda, and even the Tibetan Settlement which luckily, i was all able to go to last time, it's definite that i must see places i deprioritized the last time. The Gurkha Museum, meanwhile, was more quiet, more dark and less appealing. However, the prestige of my idols was the main focal point for my visit here. 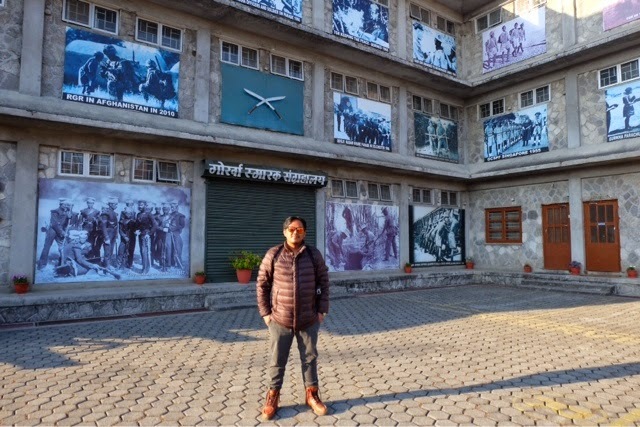 Going to the Gurkha Museum here in Pokhara was inevitable, and totally non-negotiable. I paid 200 rupees to get in, and took my time reading about the different infantries, missions, and even winter gears of soldiers. The people manning the place were very quiet. It seems that they don't get as many visitors as the former, but still worthy to go to. I bought a couple of Gurkha print outs which was surprisingly cheap as souvenirs. In the photo above, i asked my taxi driver to get the shot, standing tall and proud with the place that commemorates the best of the best. It says, "Better to die than be a coward." And with that, the principle has enveloped my mind for days now. Pokhara is still beautiful, if not the most beautiful city in Nepal. The air is much cleaner, temperature more relaxing, and the views are phenomenal. It simply is the most romantic place in Nepal. Accommodations vary depending on your budget. I am staying here at Hotel Family Home, tucked in a quiet corner away from the noise of the lake side. It's not as cheap as some hotels, but i am more comfortable here with a bigger room, hot shower, and fantastic views of the mountains. So everyday, i could see through if the weather is clear so i can plan out my activities for the day. Arjun is the enterprising manager of this hotel, he has become busy, but his professionalism exudes. A year later since i stayed here, not much has changed except for a few improvements. When i arrived in Pokhara last time, i had a lot of time in the morning as my flight arrived a little after 8AM. I went for a walk and scoured for hotels with good views. My number 1 requirements is a balcony where i can watch the mountain all day, an airy room that's not less than 15sqm, and friendly people. I didn't care much about how comfortable the bed is or how hot the shower may be. But of course, it's a bonus. I am glad, i am back here. And it seems, this hotel has a very good standing on TripAdvisor already. Makes me think i made the right choice in the first place. I arrived at the morning, and saw Arjun right away. With a big hug after a year, he escorted me back to the room where i stayed in. He said, "never leave again." During the afternoon, i always have pleasant walks around the lake. And every photo of Fewa Tal seems like a cut out from a National Geographic book. The endless mountain range overlooking a blanket of thin shimmering waters. At the lake, the view of Annapurna becomes optional. The sunset here is amazing. And then, as the sun is about to set, the cool breeze of the night starts to creep in. Never fails. Whenever i am in Pokhara, i'm at my laziest. The weather is so good that at mornings, it's hard to resist getting off bed. Usually, i play some tunes and read about where to go next. But last night, i bought a couple of books - Nepalese Customs and Manners, and a bunch of Nepales Folk Tales to keep me busy at some days when i don't feel like roaming around. I also bought a DVD documentary of Nepal, and the infamous photo where all mountains are named and captioned so i won't get confused anymore. Still here in Pokhara after almost a week. Namaste, everyone!! !